Are Justin Bieber's masses of screaming tweener fans annoying to you? Count your blessings - it could be a lot worse. "Boyfriend" singer Bieber has been slapped with a lawsuit by an Oregon woman who claims that she suffered extensive hearing damage brought on by shrieking Bieber fans at one of his concerts. 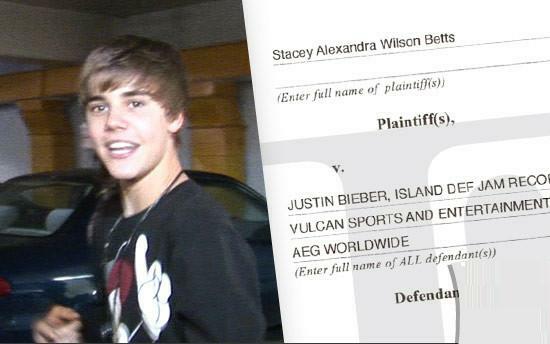 In the suit, filed Tuesday in U.S. District Court in Oregon, Stacey Wilson Betts claims that she attended a July 14, 2010, Bieber concert with her daughter at the Rose Quarter in Portland. According to Betts, the injury occurred when the singer "climbed into a heart-shaped, aluminum/steel gondola and was pulled out over the crowd." The lawsuit says Bieber then "enticed the crowd into a frenzy of screams by continuously waving his arms in a quick and upward motion." Unfortunately, according to Betts, "the gondola that Justin Bieber was suspended in acted as a sound conductor, creating a sound blast that permanently damaged both of my ears." Betts claims that, because of the alleged incident, she now suffers "hearing loss, severe tinnitus and hyperacusis (an oversensitivity to certain frequency ranges of sound) in both ears." The suit - which also names Bieber's record label Island Def Jam, concert promoter AEG Worldwide, and Vulcan Sports and Entertainment, which owns the Rose Quarter - is seeking $9,230,000 in damages, plus court costs, attorneys' fees and other expenses related to the suit. A spokeswoman for Bieber has not yet responded to TheWrap's request for comment.